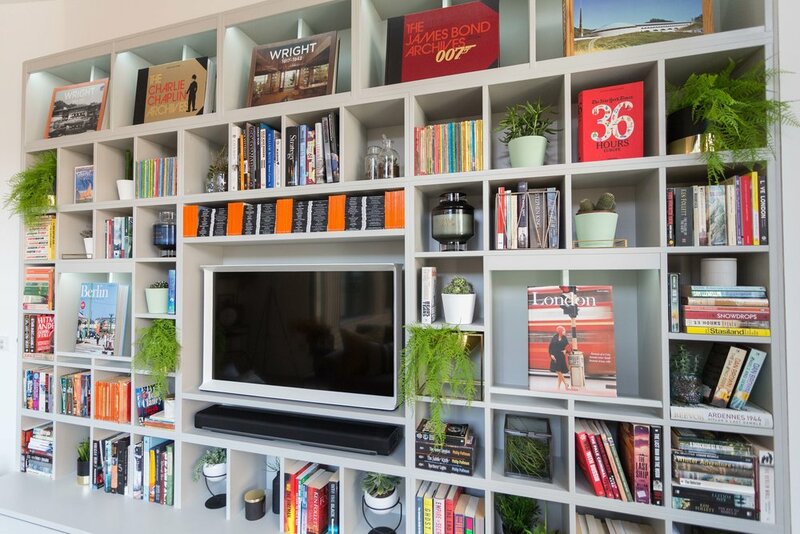 Some of you may have already seen our latest Bankside project renovating an apartment by the river Thames, as part of this makeover you will have noticed a brand new bookcase that covers the entire wall in the living room area. We designed this bespoke feature book shelving unit especially for our client as he is a keen collector of those large coffee table hardback Taschen books and needed a special place to display just a small part of his growing collection of art, architecture and film. In particular, a series of Frank Lloyd Wright books he desperately wanted to display, so as soon as we pitched the idea of creating some custom made shelves for his apartment, he was super excited about the idea, and we knew this could become an integral feature to this design project. But what goes into making something this specialist a reality for your own home? We've all dreamt of having our very own personal library, and bespoke shelving is one step towards this goal. It can be expensive, and there are a lot of considerations involved when starting to design something like this. Just how many books do you own? Sounds obvious but you'd be surprised how many people over or underestimate this, and it could accommodate a growing collection in the future. Do you have any particular items you'd like to display as you will need to ensure there is shelving space to fit these? Do you need a designated area for such items as a television, sound bar, games console, printer, or even your broadband box and telephone line? It will be important that the design will need to have storage elements to hide electricals and cables. Would you like to include a lighting system? Access to sockets and what kind of lighting is essential for this. What materials and colour will you make your featured bookshelf from so fits in with the rest of your design scheme? We worked with Jack Leith from Leith Furniture to execute this design. 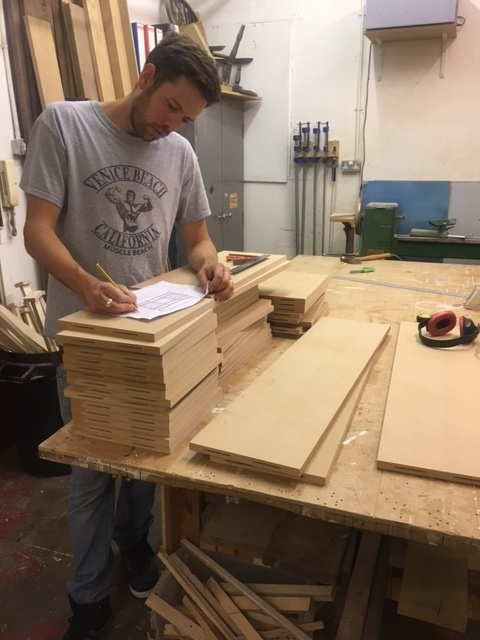 His workshop based in Dalston has years of experience with building bespoke furniture pieces, and with all the critical requirements in mind, we worked closely with Jack to come up with a solution. We strongly advise getting your designer to visit and be on site so they can see the space and take the measurements themselves. If you do them yourself and they're incorrect, you could end up wasting a lot of time and money! Select the right paint colour to complement its surroundings; it’s always good to ensure that your bespoke piece matches the rest of your interior, so it doesn’t overpower or stick out from the rest of the space (unless that's your intention). As the colour theme of our apartment was soft grey and white tone, we opted for 'Pavilion Gray' by Farrow & Ball and used this paint colour for all the woodwork throughout the apartment; for the architraves, skirting and then the bookshelving solution. 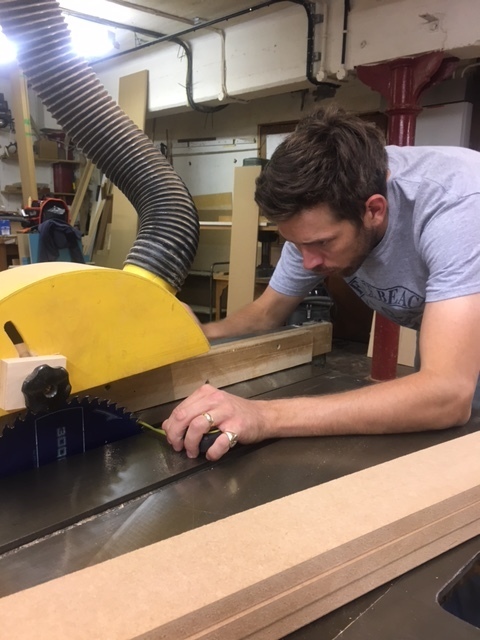 Also, remember to ensure you pick the correct material and listen to the advice of your designer or carpenter as some woods or metals may not age well or not be able to bear the weight of the items you want to display. After your shelving is finally installed, the fun part comes in - the styling! It’s always good to break up the bookshelf with smaller decorative elements or greenery. We used foliage from Abigail Ahern and candles from Tom Dixon, H&M Home and some affordable yet stylish vases we sourced from Zara Home and Decorum. Adding these items will break up the monotony of your books and stop it from looking like a real library or bookshop. Next week we'll be sharing our tips for adding air conditioning to your home and what to look out for when tackling such an installation! If you'd like to keep up to date with our other projects from Space Shack, please follow us on Instagram or like us on Facebook!